My problem is that when I connect to the campground water system, my potable water holding tank slowly fills up. This takes about 36 hours. Once the tank has filled, water overflows onto the ground so I have to shut off the main water, drain the holding tank and start all over again. I have been told that my fresh water pump may be faulty allowing this to happen. I did notice that the main water line tees off to the pump. Any ideas? Craig, indeed it is possible that city water is somehow passing through the check valve located in the outlet of the water pump. Most pumps today have an internal check valve or backflow preventer, but some may be external and replaceable. Look closely at the outlet of the pump for an additional fitting that may thread into the pump itself. 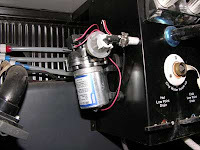 In some cases, it may be necessary to replace the pump head or even the entire pump to fully rectify this problem. Check with your pump maker to be sure. But you could always simply install another backflow preventer at the outlet end of the pump. A second backflow preventer will stop any water before it even reaches the first one. Aside from the water pump, some motorhomes are equipped with a quick-fill valve that allows the fresh water tank to be filled via the city water connection. This manual valve may be slightly open or faulty, thereby allowing city water to overfill the fresh water tank. A close inspection of the fresh water plumbing system will reveal if your coach is so equipped.